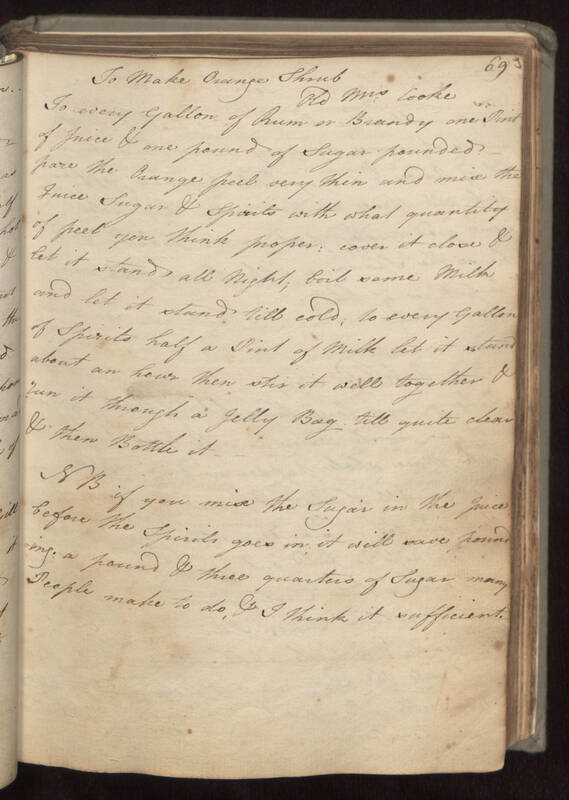 To Make Orange Shrub old Mrs Cooke To every Gallon of Rum or Brandy one Pint of Juice & one pound of Sugar pounded. pare the Orange peel very thin and mix the Juice Sugar & Spirits with what quantity of peel you think proper; cover it close & let it stand all Night, boil some Milk and let it stand till cold; to every Gallon of Spirits half a Pint of Milk let it stand about an hour then stir it well together & run it through a Jelly Bag till quite clear & then Bottle it. NB if you mix the Sugar in the Juice before the Spirits goes in; it will save pounding. a pound & three quarters of Sugar many People make to do, & I think it sufficient.